Atlantic Machine Tools gained a very good reputation in the US with the introduction of the guillotine shear in 1980. 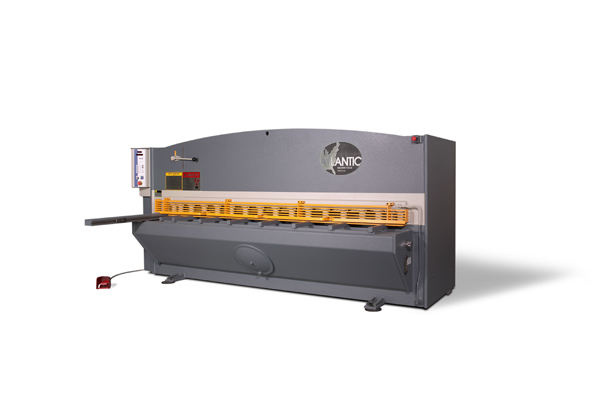 During the last 20 years, over 2,000 Atlantic shears have been installed nationwide, making it the most popular machine in today’s US market. A variety of models and configurations are available to fit any requirement. 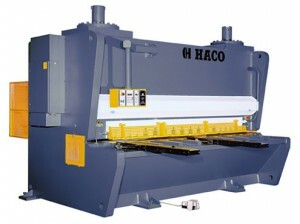 All shears are hydraulic driven and may be conventionally or CNC controlled. Safety is extremely important, so all machines come with an efficient finger guard in front of the blades and hold-downs and an emergency stop on the control panel. Light curtain systems are also available, which will guard the back of the shear to guarantee optimum safety for the operator and other employees on the shop floor. This budget-friendly model comes standard with the SP9 controller, a low-cost yet highly reliable controller for sheet cutting operations. It is easy to program and requires no specific training to operate. Cutting time and blade angle can be set with the push of a button. Guillotine-type shears rated for thicker material with several more options available, in the same easy-to-use package. Rated for up to 5/8″ steel up to 80,000 PSI tensile strength. 6′, 10′, or 12′ cutting lengths. Standard motorized backgauge, with a high-speed, swing up, or swing-away versions available on some configurations. 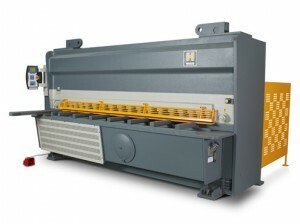 The SST model uses a high-speed swingbeam shear along with two down-acting hydraulic cylinders and two up-acting nitrogen cylinders, allowing for cutting speed to be doubled at lower capacities. All configurations cut up to 10GA steel. Hydraulic sheet hold-downs with tilting feet and neoprene bottom. 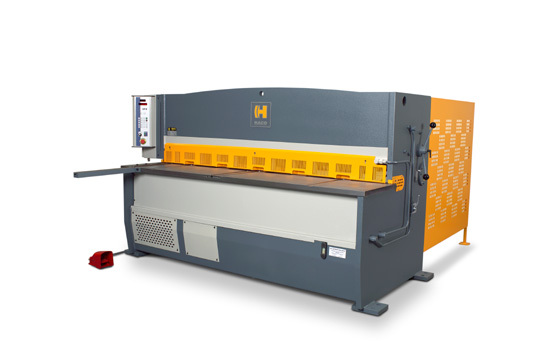 This shear is custom designed and heavy duty, accepting capacities up to 1-1/4″ and lengths up to 20′. It uses two hydraulic cylinders and one nitrogen accumulator. The SC90 controller and CNC control for backgauge, rake angle, blade clearance, and stroke length all comes standard. A wide range of PS models are available to accommodate specific needs.